WAMC proudly supports organizations in our listening areas. Our communities count on us to shed light on non-profits that focus on the underserved and those affected by natural disasters. 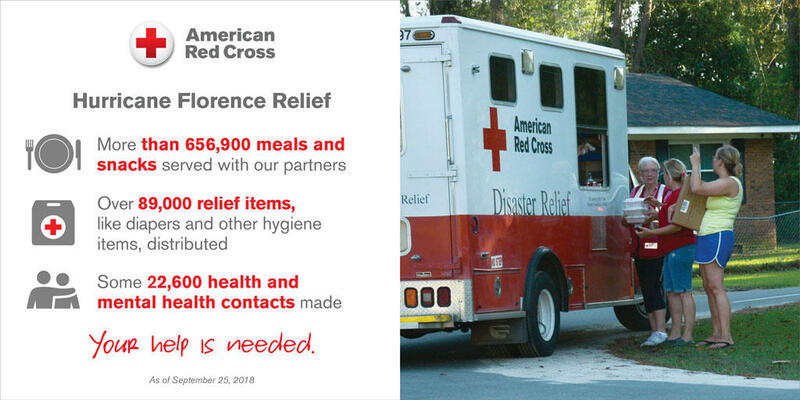 The Carolina's are still battling flooding rivers and the Red Cross is there helping with the disaster operation. If you can help support their work please visit rdcrss.org/wamcradio. A donation of any amount qualifies you as a member for a year. By supporting our Locked Box, your membership contribution can help shorten our fund drives! To give from outside of the United States, click here. Matching Gifts Program: Ask a simple question and multiply your contribution to WAMC. “How can I double or even triple the size of my individual gift without taking another dollar out of my own pocket?” You can, if you work for a company that will match your gift. Be sure to search for your company when filling out your pledge. Provide reliable support for the programs you love by pledging to make a monthly gift of $5 or more. Set up automatic billing with your credit card, debit card or bank account and your donation will renew each year until you say stop. Your membership will always stay current, you’ll receive less mail, and more of your donation will go directly to supporting the programming you enjoy. Your car has been good to you, so why not let it do one more good thing and benefit WAMC? It doesn't even have to run! Our partner, Car Talk Vehicle Donation Services, will tow it away, sell it, and give WAMC the proceeds…and you get the tax breaks. A gift of stock can provide you with financial and tax benefits while helping the station. Gifts in honor of a friend or loved one are a meaningful tribute. At your request, we can send a notice of the gift to them or, if given in their memory, we can notify their family. Gift memberships are a great way to share support for the station with a friend. You can even send along a premium as a way to thank them for their continued support. Shop at Amazon through AmazonSmile. WAMC gets .5% of the purchase price. Buy and sell on eBay. Just select WAMC as one of your favorite charities. Leave a legacy of free speech by including us in your estate planning. From bequests to charitable gift annuities, planned gifts are vital to WAMC's future and offer a variety of effective ways for helping the station. These gifts can enable you to make a contribution to WAMC while achieving specific personal and financial goals. Your support means everything to us! We work hard to bring you award-winning programming every day of the year. If you have any questions about membership, please contact us here or call (800) 323-9262 ext. 133. We also encourage you to sign up for our mailing lists to get the latest news stories and event updates. In whatever ways you have supported and continue to support WAMC, we thank you sincerely.